For the 27th in the series, following 'Space Dimension Controller', 'Palms Trax', 'Flako', 'Roska', 'Slugabed', 'Nic Tasker', 'Sarah Farina', 'Tommy Flowers', 'Milo Häfliger', 'Ikonika', 'Scratcha DVA', 'Addison Groove', 'Culoe de Song', 'Jasper James', 'Dauwd', 'Mumdance', 'RP Boo', 'Bézier', 'Young Marco' , 'Cinnamon', 'Red Axes', 'Tom Trago', "anu", "Toxe", "Mechatok", "Tijana T", "Donna Leake" and most recently "Hammer", we are excited to host Cashu. Carolina Schutzer aka DJ Cashu is one of the key figures of São Paulo's queer underground electronic music scene, where her work constantly communicates urgent political issues. In an attempt to occupy and decentralize the São Paulo scene, DJ Cashu and Carneosso created the Mamba Negra collective, an independent brand which provides a platform for diversified artists. Their street events that usually take place in abandoned and uninhabited locations, such as student and artist squats, push forward the fight for female representation and sexual and gender freedom. The collective was formed in 2013 as a platform for live and organic music and has since solidified into one of São Paulo’s main electronic music parties and expanded to become a Label, Agency and Radio station. Cashu is an active character in São Paulo’s electronic scene, frequently performing at block parties, small venues and independent collectives. She has played in over 15 cities and participated in several collectives that work for occupying, decentralizing and hacking the Brazilian night scene. She brings her energy to big clubs and festivals, playing at renowned local warehouse parties, Dekmantel Festival in SP, clubs and parties from other states, Panorama Bar/Berghain, Red Bull Music Academy Festival SP, Coquetel Molotov Festival (Recife) and CCBB Música e Performance. 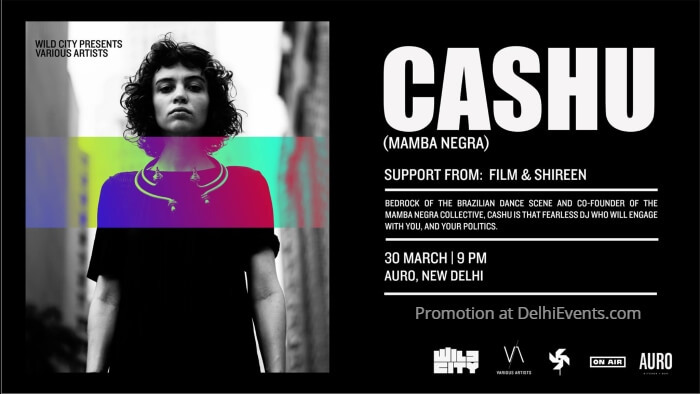 Cashu initiated in 2015 the Rádio Vírus project, Mamba Negra’s bi-weekly radio show which hosts live acts and DJ sets, supporting the local scene as it connects to local and foreign artists. Over 130 artists have been to the show. In the same year. Shireen is a Delhi-based DJ, and a member of the all-femme creative collective Coven Code. Heavily influenced by the clubbing culture of the UK and its faraway threads in the current Indian music scene, her sets draw from various dance music styles, focusing on house and techno, as well as UK garage, breakbeat, dubstep, and other subgenres falling under the UK bass music umbrella.